Starting today, AMC’s FearFest returns and with it, there’s some high expectations, here at Zombies In My Blog. In fact, last year we wondered: What Happened to AMC’s FearFest? This year, it seems there have been some changes made. We shall hold our official opinion of the changes until after the programming block has aired, but so far, we are excited to see how it goes. With more than 340 hours of holiday programming set to air (including more than 80 movies) airing from October 14th to October 31st, that’s a good start. And beginning this year, Eli Roth’s History of Horror is brand new, featuring discussions with big-named horror filmmakers as their movies air. This seems like the next logical step, after James Cameron’s Story of Science Fiction aired not too long ago, which we really enjoyed. Shown at midnight, the first episode will feature Zombies. We’re enthused, naturally. Throughout the 17 days of programming, there will be multiple franchise marathons that air, including those featuring Michael Myers, Chucky, The Exorcist, Friday the 13th, Hellraiser, 28 Day Later, Army of Darkness, a Stephen King marathon, a slasher marathon, a demons marathon and the premiere of Abraham Lincoln: Vampire Hunter. Two years ago, we declared: Why Negan Isn’t Scary and Neither is The Walking Dead, but we also wondered why The Walking Dead was even included as FearFest programming. It actually feels slightly out of place and takes away from other shows or movies that are actually horror-based that might not ordinarily get the opportunity to shine in the bloody spotlight, as it were. We’re actually hoping there will be a few new movies added to the rotation this year that haven’t been shown in a while — if ever — on the channel. Living outside the city limits, our internet isn’t so great out here in the country. Otherwise, we’d be streaming all the greatest hits of Amazon, Hulu, Netflix and Shudder. We’re hoping to somehow cover Joe Bob Briggs’ next Last Drive-In, but until then, make sure you check out our interview with the iconic movie host at a horror film festival a few years ago. Back to the main point: We’re big fans of FearFest, but we’re also one of the biggest critics to the holiday special, because we have enjoyed it so much throughout the years. Airing tonight, there will also be a sneak peek at the upcoming Halloween “recalibration” for the franchise, brought to you by the folks of Blumhouse Productions. We’re stoked to be attending a screening of the movie this week. Bring on Halloween, both the holiday and the film franchise. Also, here’s a Michael Myers Medley. All in all, it seems like quite a variety of subject matter included this year, from slashers to demons, to Zombies, to pure terror personified within a variety of franchises (and their marathons). 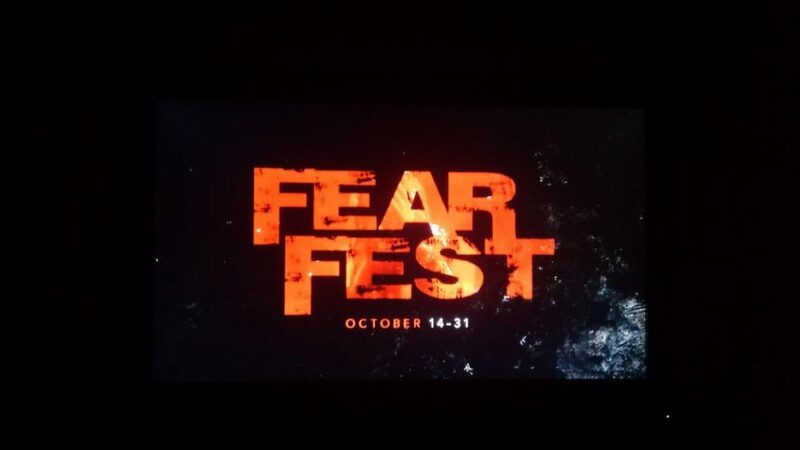 We’ve definitely got high hopes for FearFest!